Louise: So C.A.B. called and asked me if I wanted to teach the Wednesday morning ESL workshop but I’m not sure if I can pull it off because of my new UNESCO job in Paris. I think it might be too much. Steph: You’re probably right. With everything else you have going on, it’s probably too much. Louise: Yeah. I think so too. Plus, since it’s on Wednesdays, I’d have to hire a babysitter for Harry & John because they don’t have school on Wednesdays. Steph: Yeah, that’s totally not worth it. Louise: You’re lucky that Owen & Eamon have a half day of school on Wednesdays so you wouldn’t have to worry about a babysitter. Louise: You should take the job. Steph: Ummmm………..But it wasn’t offered to me and I don’t think I’m even qualified…..
Louise: Of course you’re qualified! You speak English! Steph: But I’m not an ESL teacher and I’m not legally allowed to work until February………. Louise: Who cares? This is France! So that is the story of how I became an ESL teacher to a group of eight French kids between the ages of 4-6. I teach for only 1.5 hours per week, however it’s possible to prepare for about 20 hours per week for this 1.5 hour class – no joke. So basically, I’m making about 1€ per hour. In case you’re wondering, that’s not a livable wage. Not even in France. Since I know that what doesn’t kill me will make me stronger, I should be Hercules by the time I return. Be prepared friends. 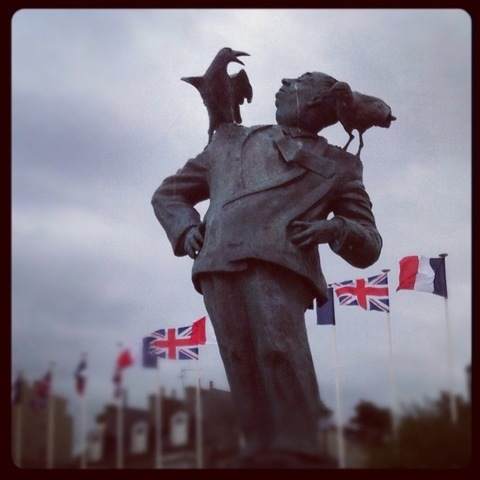 Here is a picture of Alfred Hitchock in the town of Dinard, France (the location of an international film festival). I’m putting it in this post to give you something interesting to look at. Is it a coincidence that I chose this image? I don’t think so. Each week in English class I barely make it through without covering my eyes…………………..it’s sort of like a horror film. This entry was posted in what i learned today and tagged esl, job in france, teaching. Bookmark the permalink.